Buyer activity increased with the number of sold detached single family (DSF) and attached single family (ASF) homes up 7 percent and 11 percent, respectively, from a year ago. Average prices were up 3.2 percent from the previous month and 7.8 percent year over year for DSF, while prices for ASF were down 5.6 percent from the previous month but up 6.9 percent year over year. Compared to the previous month, days on market (DOM) held steady for DSF and decreased by two days for ASF. Higher demand and lower supply could extend the compression phase – where demand exceeds supply – and push the average price for DSF homes to just below $500,000 by June. The heaviest buying months will be in the second quarter. 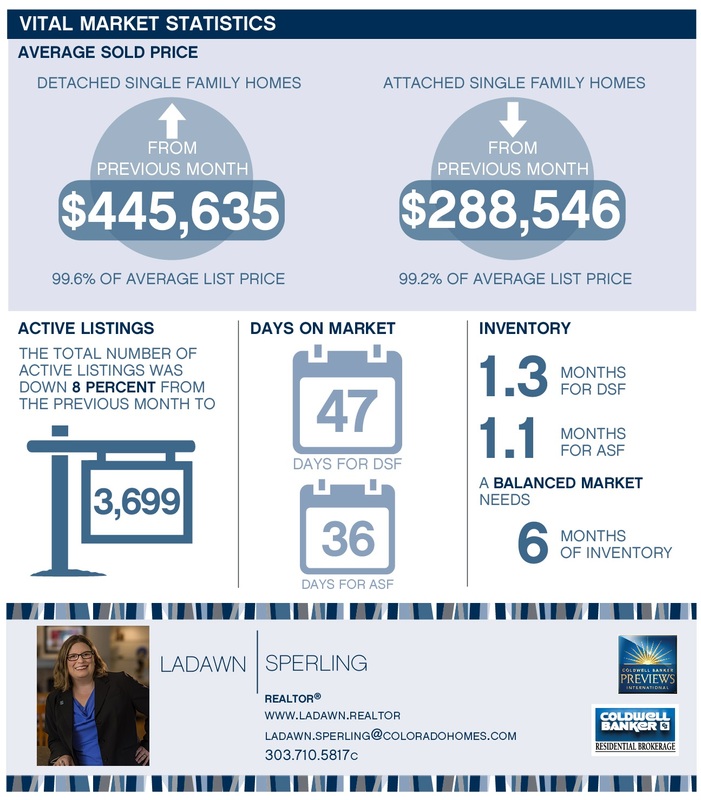 The odds of selling are expected to be highest in March and remain above 60 percent through June. With Denver ranked the No. 2 place to live in the United States based, in part, on people’s desire to live here, migration will likely remain strong keeping demand high. The one wild card is an increase in interest rates, which could result in a short-term increase in activity but have a longer-term impact on price points where buyers are dependent on loans to purchase the home. Based on information from REColorado®, Inc. provided by Land Title for the period of Jan. 1, 2017, through Jan. 31, 2017, for Adams, Arapahoe, Broomfield, Denver, Douglas, Elbert and Jefferson Counties. Note: This representation is based in whole or in part on content supplied by REColorado®, Inc. REColorado®, Inc. does not guarantee nor is in any way responsible for its accuracy. Content maintained by REColorado®, Inc. may not reflect all real estate activity in the market.